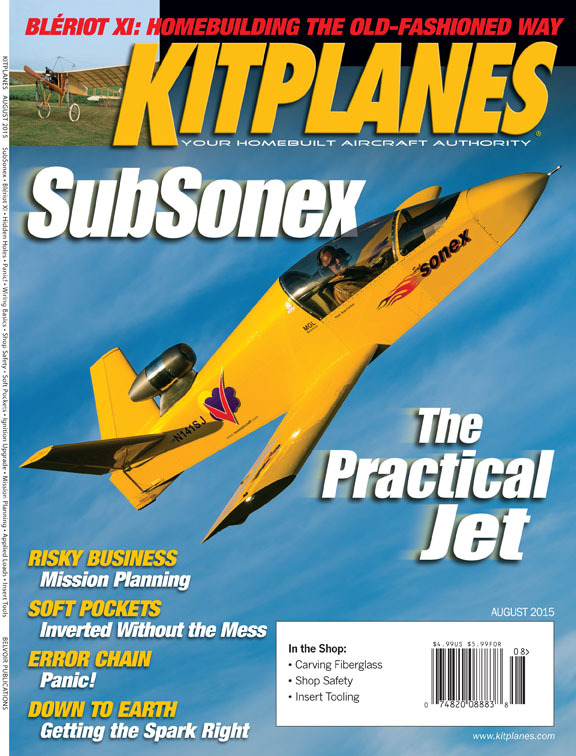 “SubSonex: The practical jet age arrives” is an expansive 19 page feature story in the August, 2015 issue of Kitplanes magazine, (download 3.7mb PDF file) written by the magazine’s editor-in-chief, Paul Dye. Paul is the first non-Sonex pilot to fly the SubSonex, and his article is a very favorable flight review of the aircraft, which includes sidebar articles about the PBS TJ-100 turbojet engine, an interview with John and Jeremy Monnett, a description of SubSonex kit contents and pricing, the SubSonex transition training process and the transition training aircraft: the TsT-14 BonusJet. A video was released in May about the SubSonex and Paul Dye’s experience flying the aircraft, which is available on YouTube.